The US press has generally played a dismal role in warning people of the imminent dangers of climate breakdown and upcoming thresholds beyond which humanity may not survive as an organized species or a species at all. The media should be every day reporting on both the record breaking temperatures of 2016 as well as alarming changes in the surface of the earth that have resulted and will likely result from the enormous heat. Questions for the recent 2016 US Presidential debates reflect the norms of disregard for climate among US pundits and the press, as no single question during the debates was posed that had anything directly to do with climate change and carbon constraints. That Donald Trump was able to win the electoral college, came close to frontrunner Clinton on the popular vote with 60+ million votes, and therefore win the Presidency on a platform that included straight-out “hard” climate denial is in part a function of the “soft climate denial” rampant in the “liberal” political elite and media. Hard climate denial, for that matter any climate denial, should in an adequately aggressive media environment, be viewed in 2016, by far the hottest year on record, as a disqualifier for high office. The mostly pro-Clinton elite media, in the latter part of the election, were supposedly either exposing or informing the public clearly about the implications and dangers of Trump’s positions, yet, as consistent with “soft climate denial”, treated Trump’s “hard climate denial” with avoidance and/or delicacy, seemingly out of fear or maybe, charitably, disbelief. A confluence of factors is at play in the US media’s failure to warn of impending climate catastrophe but one support of this failure is that anybody who appears in the news, especially the high-tone news that appears in the New York Times, tends to have a sheen of respectability applied to him or her. Scoundrels, frauds, and criminals are often made to appear at least “interesting” diversions if not deserving of a place of public influence, if they become the subject of stories in the restrained high-tone media. The editors and publishers of these media outlets are choosing, it seems, the maintenance of their own media “identities” over a clear communication with the public of content that will be very important to all of them, all of us. These identities tend to eschew alarm or the shaming of public figures, which is left to the (mostly right-leaning) tabloid (and video equivalent of tabloid) media, which in turn overuses and misuses shaming and alarm, leading to a too high noise-to-signal ratio. The application of a sheen of respectability violates journalistic ethics most vividly in the case with so called global warming “skeptics” or “contrarians”. The particular violation of journalistic ethics I am pointing out, is that while people look to the press (print and electronic) for vital information related to their survival and well-being but in the case of global warming, most of the press in the United States has almost completely abandoned it’s “duty to warn”. As an example, Andrew Revkin, who has run the Dot Earth blog on the New York Times website for perhaps a decade or more, is notorious for “boosting the signal” of climate deniers by offering them space within the prestigious precincts of that newspaper to circumlocute and deny the findings of empirical climate science. In my view, Revkin appears to be frightened of confronting the paranoia-tinged rantings and musings of those who are willfully or unconsciously in the throes of climate denial or shunting discussions to the all important question of “how” to quit fossil fuels and degradation of the global commons. I speculate that decades ago, Revkin thought he was signing up for a picturesque, quiet “beat” as an traditional environmental reporter, only to find with global warming that he was at the center of the hottest, “hot-button” political issue in the world. A quiet “nice guy”, I assume, he hasn’t yet lived up to the challenge, while giving comfort and aid to deniers. Of course copious advertisements from both the fossil fuel industries and heavy fuel consuming industries like automobiles and travel keep the media from “harshing the mellow” of US consumers; the salaries of reporters are paid in part by that ad revenue. Such a business model is susceptible to comfortable soft climate denial in the coverage an non-coverage of climate issues. Hard climate deniers and the diversionary “debate” they have sustained over the last two decades further enable the media’s soft climate denial by providing “covering fire” via spreading confusion and doubt, delaying concerted public action on climate. There is in my view, in a variety of areas of life, an unwitting collaboration or interaction between soft climate denial and hard climate denial. What coverage there is via gingerly language (“skeptics”, “contrarians”) facilitates the 20-plus-year-old massive public climate-denial fraud perpetrated with funds from the fossil fuel industries. There are two complementary roles in the “hard” climate denial-fraud industry: the fossil fuel industry funders and the supposedly “true-believing” free market ideologues that attempt to spin every angle that would slow recognition that we humans are in, as a species, a fight for our medium- and long-term survival. The publicly obvious commercial benefit for the funders of climate denial of delaying climate action excludes them from speaking too loudly and often against climate science, so they seek surrogates, mostly from think-tanks that have become the go-to PR houses for the corporate and Washington elites. The fossil fuel industry surrogates themselves are mostly right-wing “free market” ideologues who attempt to make it seem as though contradicting the physical data of climate science must have some philosophical, political or economic benefit beyond simply feeding greed and short-sighted exhaustion of the planet’s carrying capacity for humanity. These surrogates attempt to apply the (false) sheen of respectability that “free-market economics” enjoys in the press and in (unfortunately) parts of the economic profession to the global warming problem. What motivates the free-market ideologues, other than industry cash, is reflex-like defense of the “fixed idea” drummed into them by the distorted views of Austrian and neoclassical economics that government and ethics-based action in the economy are always negative, and also optional. While there are a number of problems with “free market economics” that make it an almost purely ideological, unrealistic theory of how to organize an economy, one entirely false assumption is “climate Providentialism” or more broadly “natural Providentialism”. While on a micro level in economics, scarcity of resources is assumed for any given enterprise, on the macro level, free market economics (and allied ideas such as free-trade advocacy) assumes an unbounded capacity of the natural world over time to both supply raw materials & goods and buffer or absorb the wastes of human society, enabling infinite economic growth. Study of the natural world, including climate science, shows this belief and founding assumption to be metaphysical rather than scientific and grounded in our reality. Such an assumption also supports unbounded greed and exploitation of the earth, as well as, often, greed-driven hyper-exploitation of social resources and humanity itself. In other words, in “natural Providentialism” and the free-market ideology (also shared by other economic schools) the earth is simultaneously an unlimited waste dump and unlimited treasure trove to be mined; this corresponds to the view of the most greedy human beings that the earth and society should satisfy their desires and humor them as they deposit their various inevitable “wastes” broadly construed into the external world and assume that those wastes “disappear”. 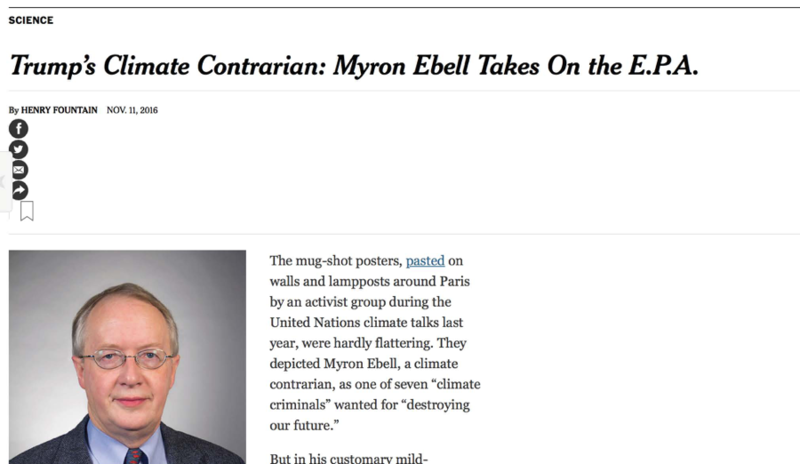 Myron Ebell is one of these either true-believing or cynical “free market” ideologues who has shilled for both tobacco and fossil fuel interests most often via the Competitive Enterprise Institute. While, Ebell, a non-scientist, entered the arena of science commentary from a right-wing “free-market” philosophical view, this has not inhibited him from calling into question the conclusions and motives of climate scientists who, for the most part are trained scientists and rarely “profit” from predicting dire consequences for the biosphere, from fossil fuel use and human-caused disturbance of natural carbon stores. Ebell, as do other key climate denialists, specializes in throwing up a cloud of doubt about climate science and keeping the debate focused upon whether the climate is warming or any dangers of that warming not, crucially, how to stop that human-caused warming. Ebell, either cynically or credulously holds fast to the idea that the quasi-religious free market ideology and the “pathology of the will” that underlies it can substitute for a careful analysis of data from the non-human world, i.e. natural science. He thinks he can erase all of its inconvenient findings with a clever utterance or alternative non-scientific “spin” on the scientific findings. As this video of an Ebell presentation to the Heartland Institute (another climate denier think tank) suggests, he also projects onto the environmental movement and governments his own fraudulent position: he accuses them of fraud, when he in fact has been committing fairly lucrative fraud in science interpretation for over two decades. He also projects onto the environmental movement and the clean energy industries that would profit from serious climate policy his own relationship to the dirty energy industries that have funded him for decades: in the above cited video he applies a strained analogy about bootleggers and Baptists. Rather than a meaningful picture of the sometimes strained relationship between the non-profit environmental movement and for-profit corporations producing clean energy solutions, the analogy is more accurately a self-portrait of Ebell and his front-man relationship to the coal, oil and fossil fuel industries. I have elsewhere pointed out that we as a civilization and a people can occupy three levels of responsibility for climate catastrophe. Those who are primarily responsible are those who have plotted to delay climate action, cast doubt on climate science, or committed us to continued fossil fuel use despite knowing that it calls into question our viability as a species or civilization. Ebell and his funders lead the category of those who are primarily responsible for the ongoing climate catastrophe, which he routinely mocks, denies, or tries to “reframe” as a net benefit to humanity. Ebell has either no conception of or in the manner of a charlatan, a con artist, omits mention of how destructive the climatic changes that are already in place are to humanity and the other species upon which our lives depend. Those who enable Ebell to have a place of power or influence will as well be placed in the category of those who are primarily responsible for immanent climate catastrophe and human self-extinction. The New York Times has published a piece in which Ebell is presented in very gentle and even “heroic” terms. Below you see the headline as it originally appeared. While actually “(rigid) contrarian” is a semi-accurate picture of the philosophical or political perspective that Ebell also says that he occupies, that characterization takes Ebell almost completely on his own terms and focuses only on his intellectual preferences and not their real world impacts. Contrarianism may be helpful for those who bet for and against public opinion or design “bearish” stock market investment strategies but is not a reliable way to generate alternative hypotheses that describe actual scientific data from physics. Taking into account a climate system that “doesn’t care” about our intentions and opinions, it would be more appropriate to say in these narrow terms that Ebell is a “gainsayer” or “obscurer” of climate science findings. Also in the Times’ title, that Ebell will “Take On” the EPA, indicates the Times may be engaged in an alarming flirtation with a potential climate denier readership. Ebell is made to seem via this language heroic for not only seeming to “buck orthodoxy” but “taking on” a bureaucracy like the EPA. The operative word, given Ebell’s mission and track record would be “undermining” or “scuttling the influence of”. The Times may be fishing for a post-Enlightenment readership of climate deniers or in the manner of soft climate denial, avoiding climate deniers’ angry, paranoia-tinged letters and phonecalls by pulling its punches vis-à-vis Ebell. Henry Fountain, the Times reporter, seems to take Trump’s plan to dismantle Obama’s Clean Power Plan and Ebell’s role in that at face value and then spend the majority of the article trying to create an “empathic” understanding of Ebell from his point of view, without the benefit of having interviewed him, himself (because Ebell refused to be interviewed). Notably absent from the piece is any detailed consideration of what the effects of Ebell’s well-paid activism have been and will be under a Trump Administration, other than the rather anodyne representation that it is oriented against Obama’s efforts via the EPA. Typical of the article is the closing, in which Ebell is given the “last word” and in which he says that he wants more funding to “combat the nonsense put out by the environmental movement”. Left out of this closing statement is that what the environmental movement puts out is supported by natural science while what Ebell puts out is contradicted by almost every empirical finding of the last several decades. All of this is published in the New York Times, “Science” Section. “Science” writers like Fountain and the New York Times editors need to be held, especially in the era of a likely Trump assault on truth and science, to a higher standard where the scientific claims of figures like Ebell need to be subjected to scrutiny. Ebell is now apparently being put in the position of helping to increase US emissions which have been shown to heat the planet, acidify the oceans and with high probability will make the earth relatively sterile for human life. The stakes are extremely high and the “human interest” portrayals of figures like Ebell are, from the Times, a betrayal of public trust and facilitating the possible self-extinction of humanity. Of course, Ebell has a name for my position or similar positions, which is “alarmism” via which he attempts to brush off both the scientific data and these criticisms of his obfuscation of reality. He interprets any and all climate data based on the idea that “cooler heads” are required in interpreting any and all signs that our climate is warming or humans effect the climate and the earth in any way negatively. His stated preference for always maintaining a “cooler head” fits nicely with the commercial goals of his funders but more importantly requires that he impose his and his funders’ preferred interpretation upon the data from the real world, which increasingly give cause for alarm or at least decisive action. Of course, as some platonic ideal, we would want to maintain a “cool head” in almost any circumstance, but if that stance means denying that we must act quickly and decisively to rid ourselves of fossil fuel dependence because of a real-world emergency circumstance, then Ebell’s preference for “cooler heads” has simply become an excuse for childish denial of reality and omitting to take prudent self-preservative action by humanity as a whole. It is not clear how deep Donald Trump’s climate denialism is, as as late as 2009, Trump seemed to believe enough in the danger of climate change to co-sponsor an ad urging action on climate change and the passage of the Waxman-Markey bill. Trump prior to then had been a figure who occupied a position near the left-wing of the Republican Party, i.e. a moderate Republican, though his various forays into local New York politics, indicated a strong racist streak, including his public persecution of the Central Park Five during the 1980’s. It is not clear whether his 2012 shift to climate denialism as well as birtherism was part of a courtship of the right-wing of the Republican party or an experiment on his part to determine how issues of racism and climate change played with the electorate. Now that Trump has apparently won the Presidency (though there are some legal matters that he must attend to prior to his Inauguration), the selection of Myron Ebell, who is one of the people most committed to climate and reality denial in the world, to supervise the EPA transition team, seems to be an expression of full commitment by Trump to climate denial. However, this in turn, if we consider that Trump was once concerned about climate change, suggests that Trump is more a nihilist or cynical manipulator than a true believer in climate denial. Perhaps this is the reality of all climate deniers at heart, in that many probably do not believe completely their professions that climate change is not real and threatening. Ultimately, the abandonment of truthful representations of reality and abandonment of an ethical commitment to create a better reality for humanity, leads towards nihilism that may be at the heart of not only Trump’s decision but also a Trump-inspired neo-fascism that seems most intent upon destruction rather than creation. Fascism is known for its culture of glorification of violent death and destruction. The Franquista slogan “Viva La Muerta” (Long Live Death) is hard to understand without considering the destructive plans and impulses that have driven fascists and other reactionaries for at least the last 200 years. That Trump and Ebell seem to want to take the entire world with them on their nihilistic trip is the ultimate in decadent self-indulgence, narcissism, and disconnection from reality. These acts of radical climate denial and spurring more emissions and warming would, if not checked by others, likely erase the traces of not only their “enemies” but of their own families upon the face of the earth. I’m not sure that Trump and Ebell want to destroy or at least decimate and impoverish their families as well as the families of others, but I cannot see into their thoughts. One only can view their acts and intentions as expressed in words and judge accordingly. This entry was posted in Michael Hoexter and tagged climate, Myron Ebell. Bookmark the permalink. The world is already over-populated. Soon the carbon-burning nations will manage to achieve sufficient global warming as to flood and starve off many of the poorer and weaker peoples and allow the rest of us more breathing space, even though the stench of these half-burnt remains will remain in our ethical sensing nostrils till the end of time. I see that the Trump campaign has encouraged you to spread your eugenicist neo-Nazi views. Climate disasters and the decimation of co-evolved species and human life is indiscriminant and doesn’t care about your narcissistic, racist theories of who is “Herrenvolk” and who isn’t. Good to stir up a few emotions along these lines, although I find the name-calling a bit unbalanced. My comments were deliberately expressed so that the last part might allow you to see how much harm and wrong we and our children will have to endure. I am against the amount of fossil fuel we burn, the huge masses of new carbon dioxide and methane gasses that are spoiling our atmosphere and the resulting global heating and sea-level rises, that are reducing the useful land that is available for people to live in. Soon there will nowhere where they can live unless an effort is made to take back the deserts. With a system of social justice, proper sharing of natural resources and sensible food production, to avoid the wastefulness of using cattle as food, the world could easily support a much greater population. Alas! we would far more easily allow the greediness of the land owners, the exploitation of growing land values which its speculators including the Trumpites have used, to dominate the fearful limitations which I acted on to get your interest, are actually a factor to which many monopolists do adhere. You expressed neo-Nazi eugenicist views. You are now attempting to either back down from them or sugarcoat them. I believe my comment has had some effect on you and was in no way “unbalanced” but was a succinct summary of your views in your first comment. Perhaps you didn’t like the way you looked (unbalanced, maybe?) in that short reflection back to you of your views.